HouLight LED tube Lights utilize the most cutting-edge LED technologies. They are perfect for T8/T10/T12 fluorescent light tube replacements and work with T8, T10 and T12 fixtures. • Corridors, stairways, parking garages. • Building, office, home, school. • Supermarkets and department stores, shops, etc. • Outdoor application only with suitable luminaries or housing. HIGHEST QAULITY LED CHIPS and LONG LIFE: LED High power factor over 0.95. Reduce re-lamp frequency with a lifetime of 50,000 rated hours. Superior performance even under low temperatures. HIGH QUALITY MATERIALS: Aluminum + PC materials, good durability and optimal heat dissipation. IDEAL REPLACEMENT FOR T8, T10, and T12 fluorescent tube. Works from 100-277V AC. 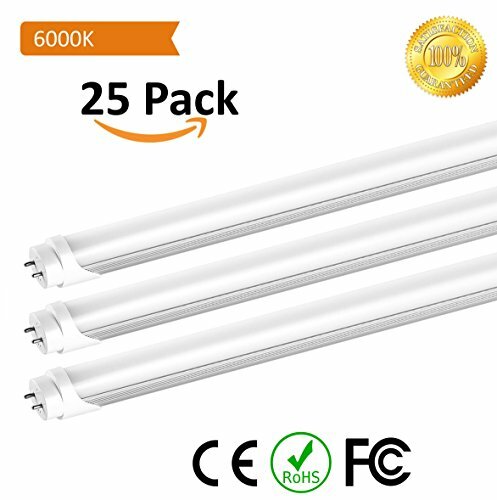 HIGH ENERGY EFFICIENCY and ENVIRONMENTAL FRIENDLY: save up to 65% compared to T8 fluorescent lamp and reduce maintenance cost. No hazardous materials included. FRIENDLY TIP: please be advised that this LED light tube is NOT ballast compatible, simple ballast bypass is required prior to the installation and use of this LED light tube.